Choose the size based on the actual wrist size against the skin without adding extra. To get the wrist size, measure snugly against the skin where the arm meets the hand with a soft tape measure or a string and a ruler. Do not add extra to your actual wrist size. Do you want a gift box? Fast & Free U.S.A. Shipping! Copper bracelets are a wonderful way to express yourself in a heathful way. This pure solid copper therapy magnetic bracelet is no exception. 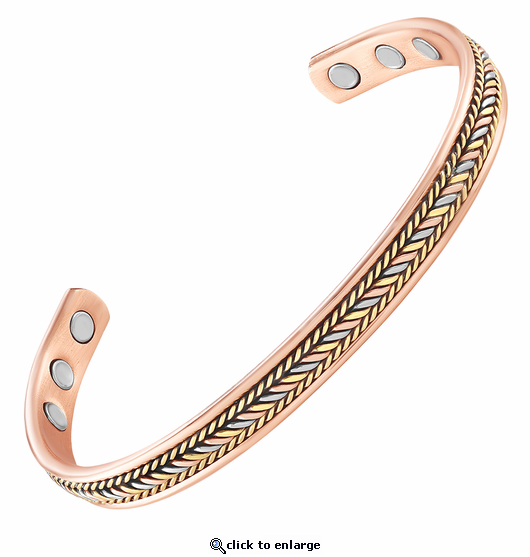 Styled with only solid metals, this copper bracelet has 6 powerful 3000 gauss neodymium rare earth bio north facing magnets and stainless steel magnet caps for added durability. It is made nickel free. This is a unique design and suitable for any occasion. For More Important Information About This Product Click Here. Very nice. Fits and feels great. Copyright © 2019, Magnet Jewelry Store All Rights Reserved.